What can you expect for your money? It is a fact that no matter how clued up you think you are, it is unlikely you really know what you can expect for your money. This post will give you an indication of what you can reasonably expect in relation to your budget. Firstly, there are a few things that you should know in relation to retail pricing. All components used in mattresses cost the manufacturer relatively the same price. Just because ‘Brand X’ uses a container full of springs on a weekly basis does not necessarily mean that they are paying substantially less for them. It then follows that it will be the same for fabrics, waddings and fillings. The raw cost price of a mattress will generally be the same, for a ‘like for like’ model, for all manufacturers. You are then quite right to wonder why there are such huge price differences for essentially the same mattress. Well, once the mattress has been manufactured, additional costs have to be added by the manufacturer to the raw cost such as advertising, promotion, transport, logistics and so on. How much is a mattress? Depending on the size of the manufacturer depends on how high these additional costs can go. The bigger the manufacturer, the higher the costs. After all these have been added, and the mattress is in the shop, there is then the retailer’s costs to consider. Shop costs of rent, rates, staffing costs to sell the bed, delivery costs to get the bed to you, and so on. After all that the retailer adds on his mark-up, or share of the profit in order to keep his business growing or to divide between the shareholders. When you find your “like for like” mattress, virtually tear them apart to see where all your extra money is going! Is it on the mattress or on the advertising? What fillings should you have in your mattress? Even though there are well over 4000 models of mattress out there you really don’t have much of a choice. How so? For a budget of around £600, the main upholstery will be either/or polyester or visco-elastic foam nothing more. When I say nothing more, I mean any other waddings added that can offer the slightest significant improvement to the mattress, other than having it contained in the specification and this inclusion could be relatively worthless. Mattresses that contain natural fibres (lambswool, cashmere, hair, cotton, mohair etc) in such a quantity for them to be beneficial or to make up the mattress completely, just do not exist for budgets less than £800. Take a quick look through the models I have on offer. Use this as a starter point as I think it would be difficult to beat. Let us say for example your budget is around £400 (Double). I say that this amount can get you 1000 pocket springs, double sided with a decent polyester wadding, reflex foam aiding the support and longevity and an above average fabric a total of 1250 GSM (Grams per square meter). Incidentally, this is our minimum standard, we do not sell a lower quality than this. Use the same initial principle no matter what your budget find out what it can get you and then try to match it or beat it for comparison. How much to spend on a double mattress? What can I expect for my money? £500 Will not get you much at best a 13.5 gauge open coil / cage sprung with a thin polyester layer. £1250 Should get you an average pocket sprung mattress. £1500 Should get you many manufacturers mid-range models. 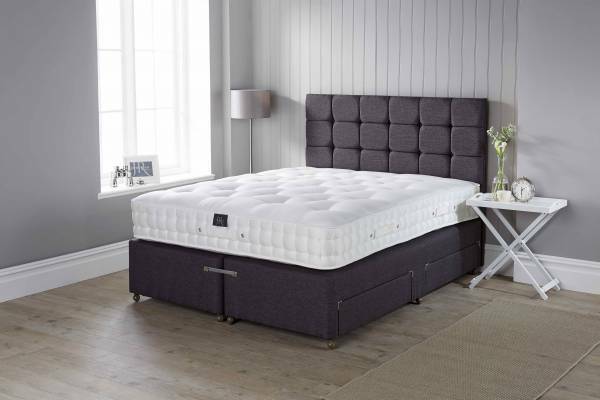 If you are looking at high-end mattresses with premium weight natural fillings as the main components then prices will indeed be in excess of the £1000 plus ballpark. My comments here relate to mass produced mattresses without a predominant natural fillings content. The rule of thumb is to get the best ‘components’ your budget can buy. If £300 can get you a pocket sprung mattress why settle for a cage sprung mattress for the same money? When a budget is an issue it is better to complement an average pocket sprung mattress by adding your own comfort layers. Do not expect to be able to get everything you need to be included. For example, you have found a 1000 pocket sprung mattress. The fillings used will no doubt be polyester (1200 GSM should be expected at the very least). You will then have to add a supplementary comfort layer in the form of mattress topper or enhancer to give you an additional comfort layer. Combine all this together with a decent mattress protector that has fitted side panels to keep everything in place. Mattress polyester: Bear in mind that as polyester is the most basic component of mattress upholstery – hence the cheap price it really does not have a very long lifespan. Without taking the above measures of care, it will not be too long for the mattress to develop dips and indents where the polyester refuses to spring back to life. Bear in mind that we all perspire through the night and this is the mattress worst enemy. It is better to replace the topper or whatever every so often than it is to change your mattress. Make sure that you are comparing like for like and component by component. After visiting a few sites without them, you will become lost and forget the important specification details. However, and unfortunately, you will soon see that these basic fundamental details are missing from many descriptions. If they are vague then phone or email the retailer or manufacturer and ask. These missing details are done purposefully so you just end up through sheer frustration, sticking a pin into a long list of potentials and hoping upon hope you have made the right choice. Don’t be embarrassed by asking what the mattress is composed of by weight! GSM is the only way you will be able to tell the construction build quality of any mattress. Have a look at Vi Springs site (and ours) as a good example of how descriptions should be listed. They tell you and show you in great detail what is inside their mattresses, how the components are put together, and you are in a better position to see exactly and without any shadow of a doubt where your money is going. This is how every mattress online and in-store should be described in order for you to sort out the chaff from the wheat. If the adequate description is not there, and you are confronted with a list of dubious and superfluous pseudo terms that mean absolutely nothing then start asking questions. Why is that there? What is the weight of? What weight are the upholstery layers? How much of that is used? Is it better than? Need more information? Then get in touch with our team of expert mattress specialists.